If there’s one thing the UK is famous for – apart from lousy weather and a rubbish football team – it’s great metal bands, and Britain has had a healthy underground scene pretty much since Adam was turfed out of Eden for playing too loud. The spotlight shone briefly on it when the New Wave Of British Heavy Metal was born back at the end of the Seventies, and now Dissonance, who’ve busied themselves recently with re-issuing the best of the NWOBHM back catalogue, have picked up on the new(ish) kids on the block. 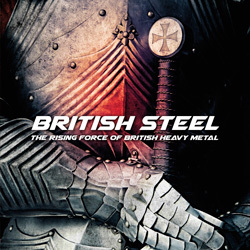 The result is ‘British Steel…’, an album of (to mis-quote Blue Öyster Cult) eleven screaming diz-busters from across this green and sceptred isle from a clutch of exciting young bands who deserve your wholesale attention. A couple of the more famous names bookend the compilation, with Amulet’s ‘Highwayman’ (a demo version of a cut on their upcoming second album) opening procedures and Wytch Hazel’s ‘Freedom Battle’ (taken from their recent album ‘Prelude’) wrapping things up. Along the way, and in nothing more than alphabetical order, Aggressive Perfector, Dark Forest, Eliminator, Neuronspoiler, Seven Sisters and Toledo Steel all represent the new age of traditional heavy metal, while Dungeon, Insurgency and Vuil come at things from the more aggressive, thrashy side of the street. ‘British Steel…’ is not perfect, but it doesn’t have to be. It’s gritty and exciting, and that’s what counts. It’s a something-for-everyone outing, and a great celebration which features the talent of today and the heroes of tomorrow. Even if not every act floats your particular boat it’s still great to come across an assortment of new bands all doing what it takes to keep the UK scene fit and healthy. Raise a glass – and the horns – to the faces of the next twenty years of metal.